entAscc is dead! – Long live Ivercy! It is incredibly hard to find a good name for a software product, for any product. Big corporations spend serious amounts of money and employ whole teams or agencies to come up with good names for new products. And still they fail sometimes. I am not a big corporation and do not have huge sums of money at my disposal to pay someone to find a product name for my product. So this really made me struggle. Struggle so much, that in hindsight I have to admit: I failed. At least once. - So I had to make this experience twice. entAscc seemed to be a good choice of a name when I first though about how to name my source code control solution for Microsoft Access. The prefix “ent” would have been the beginning of the company’s name I thought I would set up for this product. So I thought it made good sense to start the product name with this prefix. “Ascc” is simply the abbreviation of Access source code control. It is a fairly short name, the .com-domain was available and neither this name nor anything similar was used on the internet before. So for me this was a clear, easy and straight forward choice. – I was wrong! I should have seen the writing on the wall, when people started to ask: “What does this name mean?”, “How is this pronounced?”, “How is it spelled again?” And even more so, when I (should have) noticed, that many more people did not ask anything, but avoided to mention the name altogether. Either because they could not figure out how to pronounce it or because they simply could not remember it. – But I didn’t. Then I had a consulting phone call with Andy Brice of Successful Software. Only after he told me outright, that he thinks entAscc is a horrible name for a software product, it began to dawn on me, that I might have made a mistake. So I started all over to find a name for my product. Setting up a separate company just for this product seemed not to be sensible any more, after considering all the paperwork and legal stuff involved with it. So this idea was deferred indefinitely anyway and not relevant to my search for a product name any more. In hindsight I think it was a poor idea to try to incorporate a company name into the product name in the first place. I tried to come up with a new name by writing down dozens of possible names that came across my mind. Tried name finder websites on the internet. - Most of them are crap, but there are some good ones out there like Wordoid. - After that, I ended up with a list of about 15 possible names. I mangled them around, reversed them, tried different combinations of parts of them, abbreviated them, added suffixes, prefixes and so on. Whenever I had something that might be a real option, I checked the availability of the (.com) domain name, which eliminated most of them right away. After some pondering the problem, I had a shortlist of some six names or so. On that final shortlist, there were two different types of names. On the one side there were functional names like Access Version Control. On the other side there were fictional or fantasy names, that were just made up words, that do not exist in any language - at least not that I know of. One example of such a fantasy name is Ivercy. As I did not want to make the same mistake as with entAscc I conducted a survey about the two favorites in a small group people from my target market. The results were reasonably clear. Access Version Control was most participant’s favorite because of the clear meaning it conveyed. But Ivercy was close behind and did not receive any total devastating, negative critique as entAscc did. I asked other people, whose opinion I value, about their take on those names. Several interesting discussions arose from that. And most of the time it boiled down to the discussion of fantasy name (like Ivercy) versus a functional name like Access Version Control. The main argument for a functional name is that such a name makes it very clear, what the product is about. With a name like Access Version Control every Access-Developer, who knows what version control is, will instantly have a pretty accurate idea what this product does. Such a name will have additional search engine optimization benefits, as a site whose domain name matches people’s search terms will rank much higher in search results than a site with identical content but a different name. But in my opinion such a functional name most often is a description only, rather than a name. I think, a name should convey an identity. And a product should have an identity. For me a name that does not convey an identity is not a real name. Some people, who advised me during the process, had the opinion that marketing wise it would be better to clearly convey what a product does, than have a name with a strong identity. Especially for a niche product that never will bear any relevance to a major mainstream audience. In the end this all boils down to having a name that rather stands for who we are than what we do. And finally a decision was emerging. So while it might be unwise to forfeit the enhanced marketing (SEO) power of a descriptive, functional name, I deliberately choose to waive those advantages and rather choose a unique, made-up name for my version control add-in. – Ivercy. So you might ask, why after such a long process I choose this name. The name Ivercy was initially made up by my girlfriend Sylvia, who mostly liked the sound of it. But after a moment I recognized that I had almost the same name written down at the very beginning of my long list. My variation on the list was derived from “Integrated version control”. Mine was not looking and sounding as natural and so it did not make it to shortlist. But Ivercy did not have this problems. But while this is and rather subjective argument for this name, there are several objective pros for this name. · It should be easily pronounceable, at least for someone who is familiar with the English language. · It should be fairly clear how it is spelled, if you hear it being pronounced. · The .com-domain is (was) available, which nowadays can’t be taken for granted for any combination of 6 letters. However, the most important pro for this name is totally subjective: I like the name, I like the sound of it, how it is spelled and how it looks. So it is: entAscc is dead. Long live Ivercy! 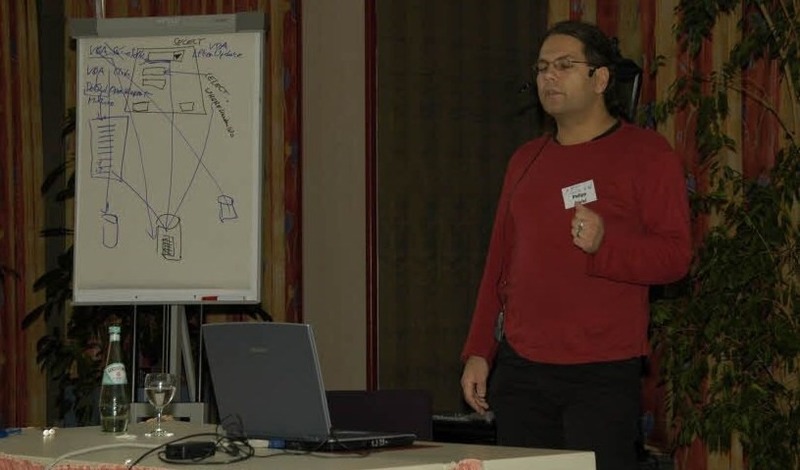 I will be speaking at this years AEK-18 (Access-Entwickler-Konferenz) about working with Microsoft Access and source code control. Of course I will be showing how to work seamlessly with source code control using Ivercy there. But the scope of the talk will be much broader and will deal with general aspects of source code control and Microsoft Access as well. The AEK is a very informal and relaxed conference and features some of Europe’s best known technology experts for Microsoft Access. If you are working with Access and are based in central Europe you should definitely consider taking part. All the talks will be in German though. For the complete agenda and other details visit the the official AEK website. If you want to discuss any matter with me in person, don’t hesitate to approach me. Hope to see you there. I’m excited about the latest new feature in Ivercy. I call it Ivercy Local Change Tracking (LCT) and it’s really cool. Let me tell you a bit about it. If you ever worked with the Microsoft Source Code Control Add-In in Access, you most certainly know the problem. Someone else in you team has changed a file (an object in Access) and you know nothing about it. Maybe the SCC-Add-In displayed the Checked-Out-Status for some time while you colleague was working on it, but it changed to Checked-In after a while and you do not know if your team member actually changed something or just undid his changes. If you actually noticed it and are interested, you could do a Diff of your local version against the repository and will see any changes, but that is a hassle. It is like flying blind. …it doesn’t get it. It just does nothing. You know the changes are there, but you just can’t get then. – Frustrating. The only thing that helps here, is deleting you local copy of the objects (forms, reports, etc.) , including it’s temporary file in the working directory and then get the latest version from the repository. One of the underlying problems is, that you are not working directly with the source files, but with their representation in Access. Access changes the contents of the files while you are just importing them. So you are working on an incarnation of the file that might be different from it’s current source file, but these changes are irrelevant. If you actually modify the file yourself, the changes suddenly matter, but from the technical point of view, the MS-SCC-Add-In can not tell the difference. The change tracking features of your SCC-Provider simply can not track changes to the objects in Access. They don’t see those objects there because they know only about the files. So here comes Ivercy Local Change Tracking. Ivercy is a version control add-in that runs within Access. It’s Local Change Tracking feature calculates and tracks it’s own checksums not only of the files, as the the SCC-Client will do, but also of the objects within Access. This allows Ivercy to know which objects are still matching the source files in your local working folder and it is able to highlight those objects that don’t any more. It does not matter if you checked out an object or not, Ivercy shows you, if you modified the object. That is what matters much more than the former. See this screenshot of the Access Navigation Pane. In addition to the usual icons for Checked-In, Checked-Out, etc. it has small informative icons that show you additional status information. The small asterisks indicate that you modified an object. Your local object is different from the version you pulled from the repository. And it does not matter if these changes are only in Access or already synced to the files in your local working folder. Ivercy recognizes both types of changes and marks them for you. – This is great, isn’t it? But wait, it get’s even better. The most annoying problem described above weren’t your own changes, but the changes of someone else. These changes have to be tracked by you SCC-Client as they are only available in the repository yet. But the good thing is: Ivercy visualizes these changes other team members did to you. See the red exclamation point next to some files SCC-Status-Icons? These indicate that there is a newer version of that object in the repository than you have got on your local computer. – So no more flying blind. You see what really goes on with file and Access-Object modifications. And as an explicit side note to the Subversion users and all others who favor Edit-Merge-Commit: This is extremely valuable help in your style of working. You are not so dependent on the Check-Out/Check-In-Stuff any more if you want to be supported visually by your SCC-Solution. This also proves some of the points I made recently in defense of the MSSCCI-API for the use with Edit-Merge-Commit. Ivercy Local Change Tracking is not yet included in the current version (V0.9.11) available for download. It will be included in the next release of Ivercy. This blog post describes only the most obvious benefits of Ivercy LCT, there is even more to it. Stay tuned for further updates. Why don’t you sign up for the Ivercy newsletter, to be among the first to know? Or join our beta program to test Ivercy right now! The previous part in this article series left off, when I put the project on hold indefinitely in 2013 due to technical difficulties and other work commitments. Earlier this year (2015) I was in the fortunate situation to have completed all major ongoing consulting work for my clients and finally had a bit of “free” time. So I did some research on the state of source code control and Microsoft Access. Unfortunately, even though almost two years had passed, the situation regarding source code control integration into Microsoft Access 2013 had not changed a to better. My research revealed that there were several open source projects for Subversion or general source code control integration, but on the first glance they seemed all to be just in various states of incompleteness. And I got the impression they would not fit well into my workflow at all. While still none of my clients had upgraded to Microsoft Access 2013 that had become a dark shadow looming on the horizon. This was only a matter of time, so I had to find a solution soon. Furthermore I was contemplating the idea to become a Micro-ISV (Independent Software Vendor) for quite a while. But had given up all earlier approaches to that end because they seemed not to be viable at their time. Now I lacked the idea for a product to build and sell that was really providing value to someone enough for them to part with some of their hard earned money. In that situation I had another look at the code of my source code control integration add-in. I started once again to ponder the problem of integration into Microsoft Access and luckily had an Idea that finally worked out much better than I expected. With this hurdle out of the way, I finally decided to try to develop that old SCC project of mine into a real product to sell to other developers. While there was still a lot of tedious and sometimes frustrating work to do, to bring the integration into Microsoft Access to a point where I was happy with it, it was all doable and there were no further total blocks that would jeopardize the whole project from the technical side. My previous work experience lies mainly with consulting. So it was quite challenging to learn all the other skills required to bring a product to market, like mapping out a marketing strategy, using Google AdWords and Bing-Ads, creating a modern and appealing website for the product. But I love challenges and learning those things was new and interesting. So while it all was taking so much more time than I had anticipated, it was rewarding and enjoyable work with a goal in sight. I am well aware that it is usually not the best choice for a solo entrepreneur Micro-ISV to do all that work yourself. It is rather advisable to outsource it to someone who is experience with it and gets it done much quicker. Still I do have the philosophy to first learn the basics of how things work myself before I even think about outsourcing stuff to someone else. So while it is clearly not the most effective way to go about things, I still am happy with my choice of doing all that myself for the sake of learning it. When I first decided to build the product entAscc from my experimental add-in-code, it planned to release the first non-public beta version at the beginning of April 2015 and the first public release about a month later. Now it is the beginning of May and it is just a little over week that I released the first non-public beta of entAscc. Extremely valuable feedback is coming in from the testers now and that is giving me a new boost of motivation, to complete the final steps to a public release. I am curious how the future of entAscc will unfold. I'm using source code control for Microsoft Access development since the year 2002 and I cannot imagine developing without it now. I'm working frequently with distributed teams and source code control has proven itself to be invaluable for our development process. So it came as bit of shock as Microsoft announced that there will be no source code control add-in for Microsoft Access 2013. I was wondering: What could I do now? 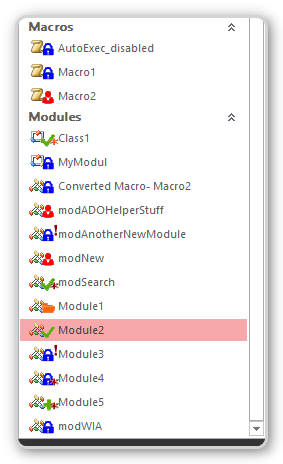 The only viable alternative to the Microsoft Source Code Control Add-In at that time was the OASIS-SVN add-in for Microsoft Access that provides Subversion source code control integration for Microsoft Access. But I started working with Microsoft Visual Source Safe for source code control in 2002 and later, as is was the most painless way to upgrade to a "proper" source code control system, changed to Sourcegear Vault. - An excellent product that is meeting most of my needs for source code control until now. So I was not prepared to move my numerous existing projects with many years of history over to Subversion. From the day I was one of the early beta testers of OASIS, I asked Bernd Gilles, the maker of OASIS, if he would consider supporting Vault or the MSSCCI. Although het put support for Sourcegear Vault on his OASIS roadmap early on, there seemed to be not much happening in that regard even years later. At that time I found the documentation for the MSSCCI-API on the MSDN Website by chance and decided to just try if I could implement an Access add-in for source code control myself. So in early 2013 I started writing code without much of a planning of design phase, rather for the fun of it. The source code control API was not too difficult handle and I made good progress implementing that. However, as soon as I reached the point where integration into Microsoft Access came into focus, I hit one barrier after the other, each harder to overcome than the previous. The problem was, there is no documented API for Microsoft Access that allows third parties to integrate into the inner workings of Access the way I felt was necessary to build really seamless version control into the Access IDE. In summer 2013 I put the development on hold as I could not find a way to properly integrate into the Access Navigation Pane. At the time none of my clients was planning to upgrade to Microsoft Access 2013, so I did not really feel the pain to push on and overcome those barriers. Furthermore several client projects were taking all of my time back then. And as time went on, the temporary hold for my SCC Project became a rather permanent one. Continue reading part 2 of this series here.